The following simulation help you visualize the Coriolis effect in a 2D plane! https://serc.carleton.edu/teachearth/activities/181248.html has paper worksheets for students to rotate by hand and when used with a small marble as the projectile, may be able to illustrate the concept. 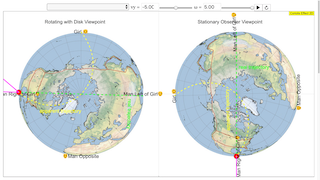 Another good hands-on idea is to get one student to rotate real paper with the globe the North Pole showing to turn the paper anti-clockwise, another student to plot using a pen a straight line across from equator to North pole, the pen mark will actually be bent due to the rotating paper. Try this! It is surprisingly good for students and they will have a better chance of getting what the Coriolis Effect is. https://www.youtube.com/watch?v=6L5UD240mCQ The Coriolis Effect by What The Physics? !